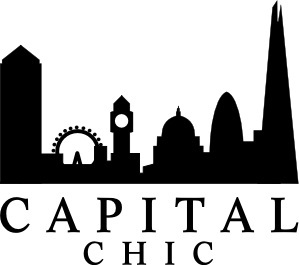 Here at Charity Shop Chic, April has been renamed ‘Carrie Bradshaw Month’ and I am attempting a series of remakes in tribute to everyone’s favourite fictional fashionista. This is part 3 of the series. 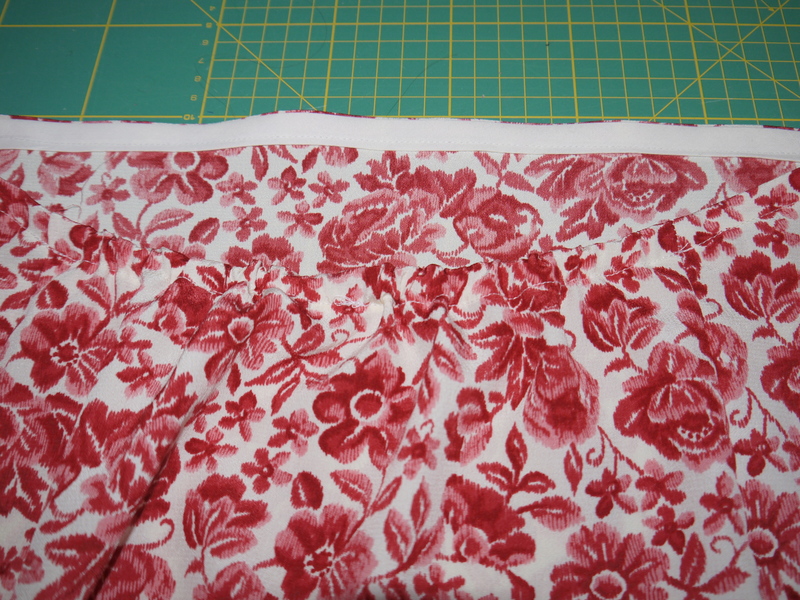 The third project in this series starts with a flowery skirt. This came from the Cancer Research shop in Whitby and cost £6.00. It is size UK 14. Here’s the inspiration picture: Carrie in the SATC movie! The best feature of this dress is that spectacular ‘balloon’ peplum. A peplum like this is really a flared overskirt gathered onto a shorter, narrower lining. I came up with a really basic design for a dress with a balloon peplum. Here’s a quick schematic, but it’s based on a strapless tube with elastic at the back neckline to hold it up, and belted to produce a waist (of sorts). The pink shaded sections below are cut from the fashion fabric and the white sections are cut from a lining fabric (you guessed it… bits of an old sheet). There wasn’t enough fashion fabric for the skirt, so I cut the section covered by the peplum from lining too, to save material. 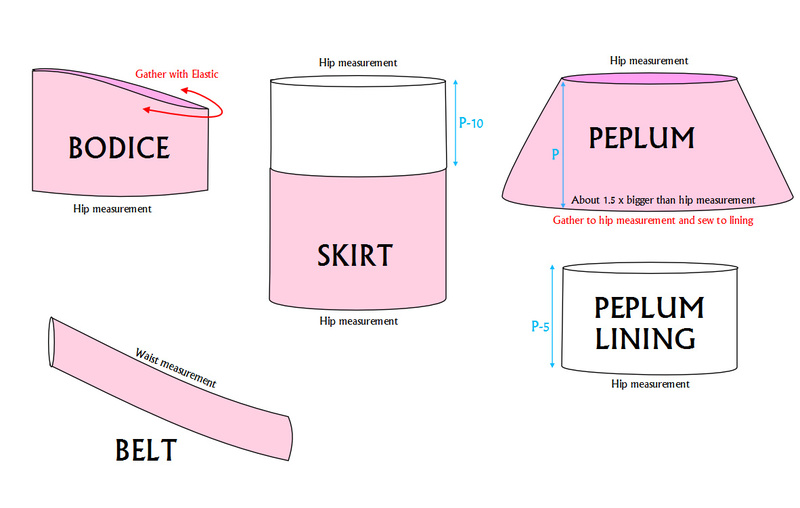 The blue arrows below are supposed to show that the peplum lining is shorter than the peplum, and the white section of the skirt is shorter than that, so it isn’t seen. The bodice is essentially a tube, cut lower at the back neck, with some elastic gathering it at the back, to hold it up. There’s also a belt cut from a narrow tube of the offcuts, slightly gathered as per the inspiration picture. …the balloon peplum, which possibly could have done with being a bit more balloon-y…. 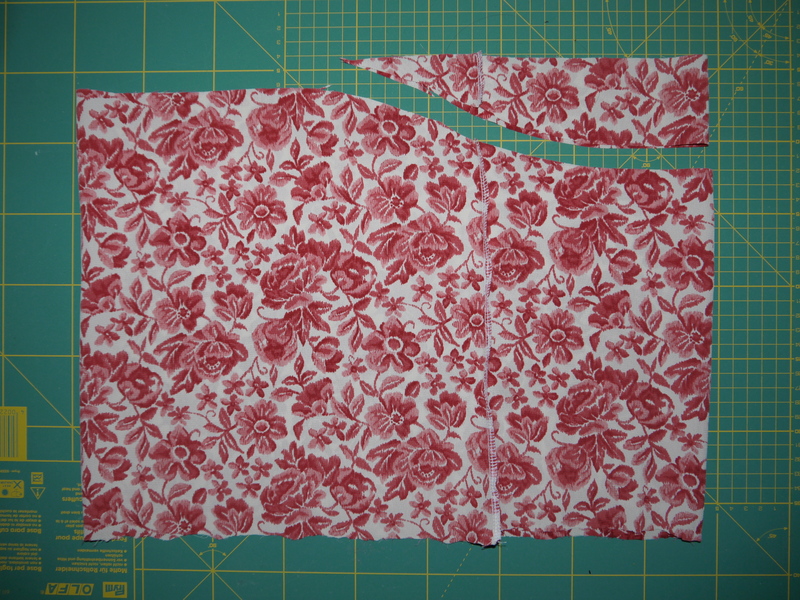 ….and the bodice. You can see I cut about 5cm off the back. 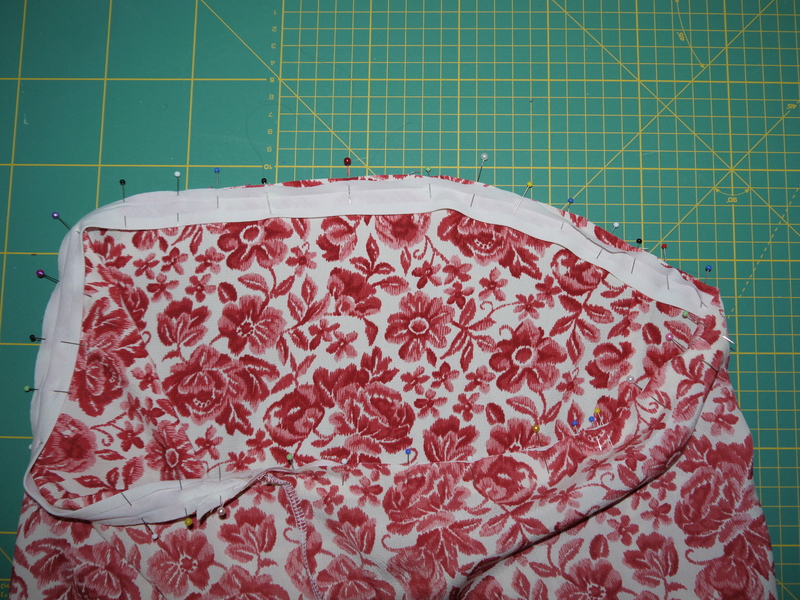 I used my tried and tested bias-binding-as-a-cheater’s-facing technique for the top edge. 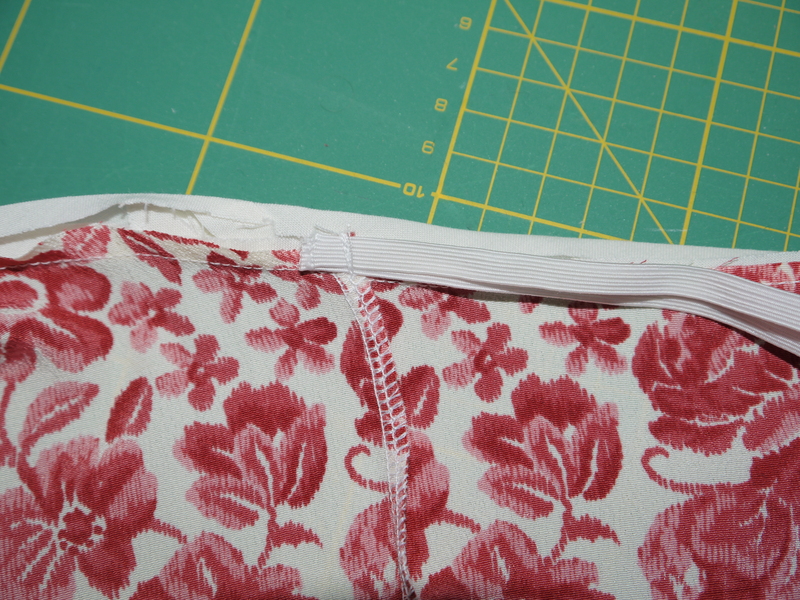 Open binding, pin right sides together, sew, press to inside, topstitch. Here’s a close-up. I put some elastic in the channel created by the binding/facing to hold the thing up. 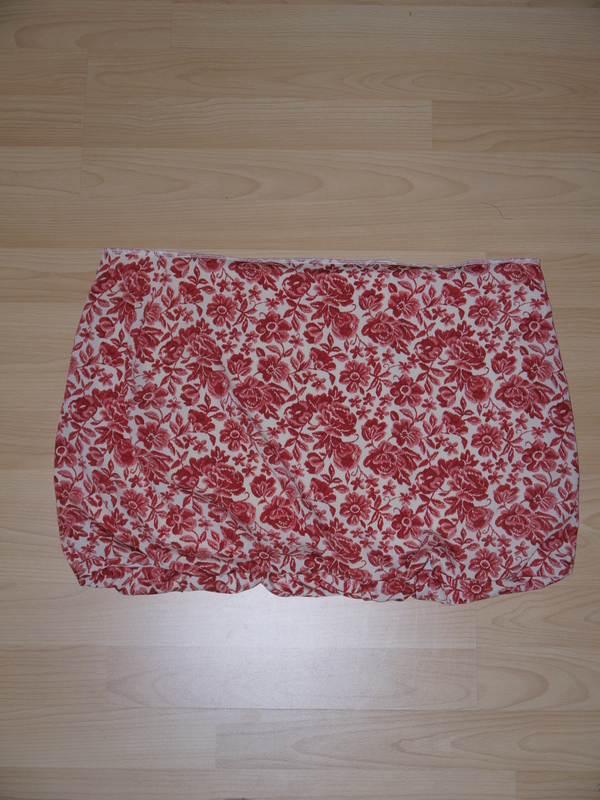 After sewing the peplum, skirt and bodice together at the waist, this is how it looked. Pretty shapeless. 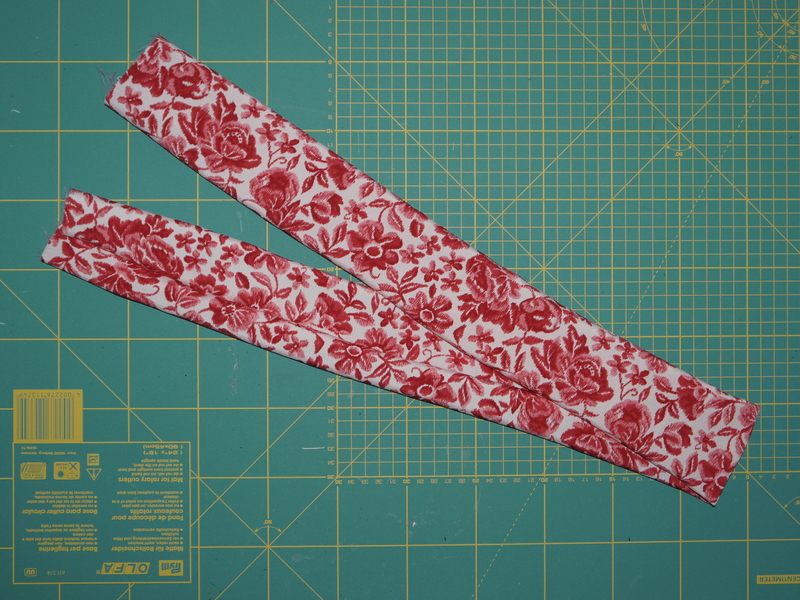 Not to worry though, I whipped up a quick belt in self fabric as per the inspiration picture. I have to say that personally the self belt is a bit much for me… when I wear this in future I think I will pair it with a white belt (or some other colour) just to break up those flowers a bit. Here’s the end result. I’m pretty happy with it, considering the really basic design and minimal amount of fabric. What do you think? Wow, this is seriously impressive drafting and the end result is perfect! Hi Marie, it really was quite straightforward, and some of it was a bit fudged :) Really happy if you think it resembles the original – thank you! You are so clever and again, I much prefer this version to the original. Thank you Kate for the kind comment. You are truly a wonderful sewing inspiration! I would never be able to see one thinga and turn it into another. Gah, I love your posts! Thank you so much, I’m blushing… Glad you are enjoying reading and stay tuned for the Grand Finale of Carrie Bradshaw month which is on its way! I’ve been loving this challenge so far! The discussion of your simple pattern drafting plus facing techniques are really inspiring! Glad you found it useful Gwen. Amazing refashion! I think your version is much more versatile than the original. 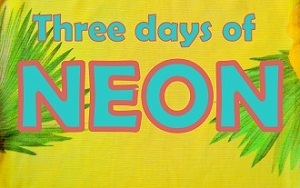 And what a clever idea of having a month dedicated to recreating pieces from a fictional fashion icon’s wardrobe. Can’t wait to see the Grand Finale!! I just stumbled onto your blog a few days ago. You are such a talented and creative individual, and you share that with all of us. Kudos. Hi Shelley, kudos right back at you for leaving such a sweet comment! Keep reading, that Grand Finale isn’t far away now! I am truly inspired by your blog, I have just stumbled across your blog and i love it. 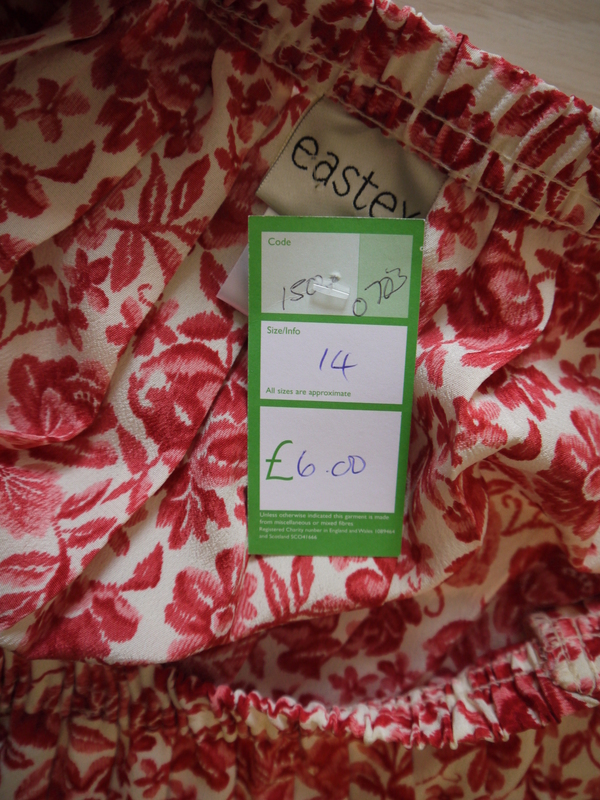 I love charity shops but i don’t have the skills to turn my visions into reality. I recently fell in love with a single quilt cover with little aliens all over it and new it would make the most amazing dress but whimped out as i have no idea. I think reading your blog will give me the gumption to do it. keep up the creativity and thanks for sharing it all with us. Thank you so much Rebecca, I am glad you are enjoying reading. You should have bought the sheet! You could have started with a skirt or something easy. Hope you will get started with refasioning soon. So nice!!! I’ve been wanting to make a peplum, but just haven’t found the time. Thanks for the inspiration! You’re welcome :) Check my other post ‘Pep Talk’ for a slightly different take on peplums. Very cute ! You’ve really inspired me to re-watch the SATC episodes (I own ALL the DVDs) and to make up some outfits of my own. 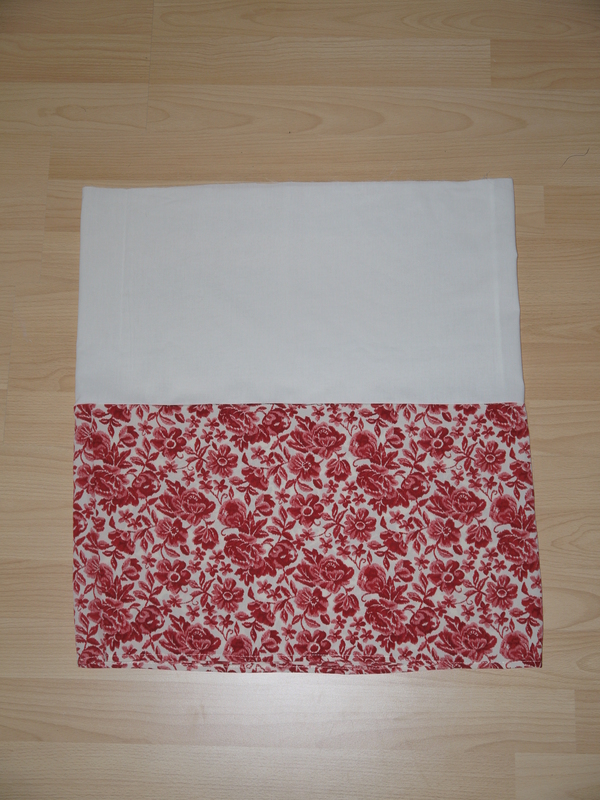 I will post them on my blog (sewliltime.blogspot.ca) and on Refashion Co-op when I do. And can’t wait to see the Grand Finale !!! Thanks ! Yes Claudia – get watching! :) and stay tuned for the final part of this series, coming soon. Awesome!!!! Great job, it looks gorgeous on you! Your’re just getting started with Carrie inspired garments! You could easily go all the way to summer and not duplicate one item. Seriously, this remake is so amazing! 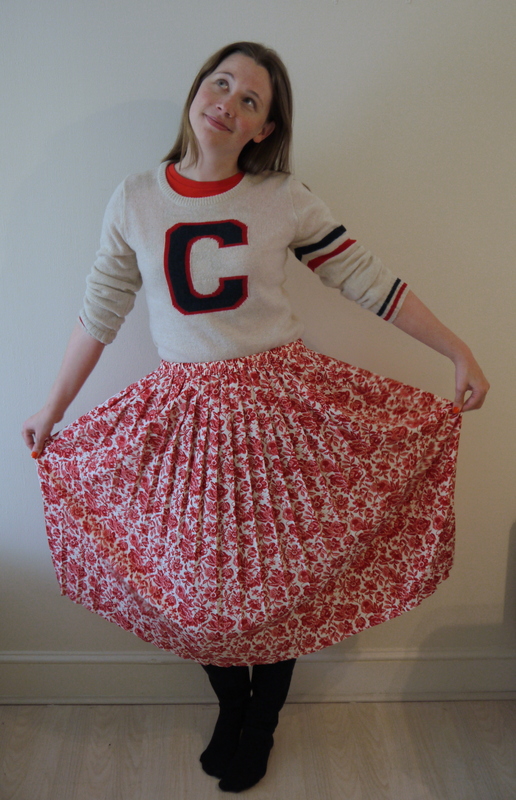 You turned a frumpy skirt into super fashionable garment. 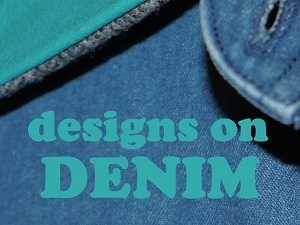 You have the eye for refashion. I love that you don’t just shorten a garment or take in seams and end at that point. You make the whole process so inpiring and offer great tips on how you achived the end result. Look forward to more Carrie garments. Yes, there is certainly a lot of inspiration to be had! 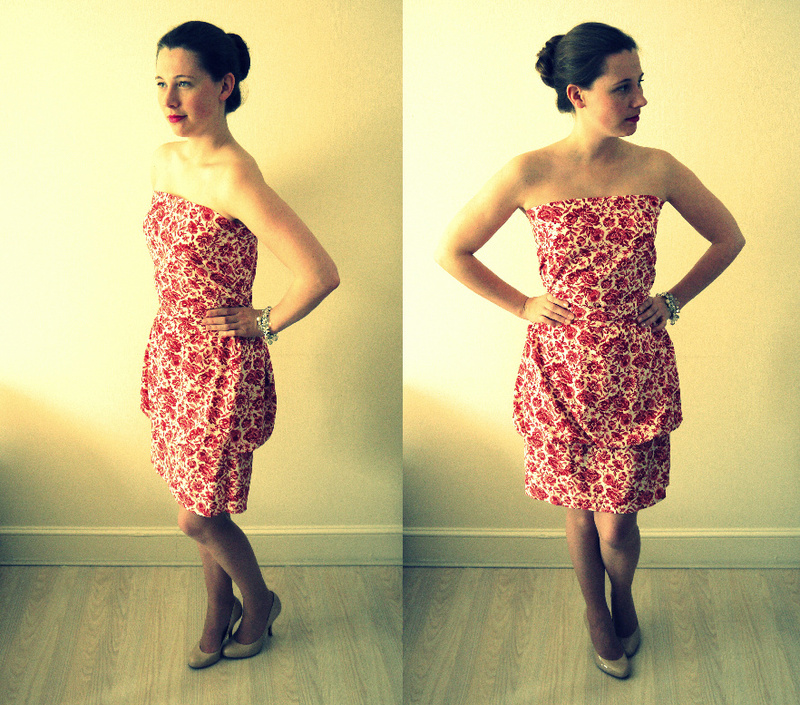 :) Glad you liked the dress, it was a major overhaul… and rather a lot of work. Your dress is even better than the inspiration dress! Thank you so much! Stay tuned for the final part of the series… coming very soon! This is stunning! Really really beautiful. One of my favorites. Thanks, it’s one of my favourites too! you are killing me! I have spent my whole morning reading about your projects. I am a beginner at sewing and this is EXACTLY what I want to do, take stuff I find at thrift stores and recreate them. I’m still learning, I was so proud of my scarf that I added lace to from table clothes, then I find you… lol… I have a ways to go still working on making big tees small and jeans into skinny… I’ll get there though your work is amazing! half the battle is having an eye for it, the other half is knowing how to execute it! Well done. I pinned you for future reference and I love your work. amazing! !